You bought a high-quality product from us, now let's get it to you! Our customers do not wait for weeks to receive the jewelry that they have bought from us. Why wait for ages for someone to make the jewelry while CaratsDirect2u can get it to you faster? We pride ourselves on our super fast handling time of 3 - 5 days! We offer our customers free ring resizing*. Upon receiving your purchase order, we will send you an email asking for your ring size. Our policy is to send the ring out in the size stated on the item description page when we do not receive an answer from you within two (2) days. 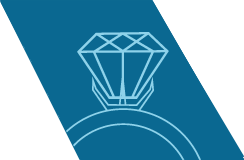 If you do decide to have your ring resized, please note that this will add an extra day to the handling process. Please note that all our rings can be easily be resized by any qualified jeweler, should you decide to do so in the future. We only ship within the United States to street addresses. We do not ship to P.O. Boxes or similar addresses. The billing address must be identical to the shipping address. All items are shipped fully insured and require a signature at delivery. We currently ship to the following countries: United States, France, Germany, UK, Canada, Australia and Japan. We use FedEx to ship our international orders. You will see the latest up to date shipping quote during checkout. If your country is not on this list, please contact us to check shipping availability. To avoid unexpected additional costs when your package arrives, check the customs, import tax and VAT policies in your country before you complete your order.